It's the end of the year and many properties are making plans to purchase a sourcebook to help find sponsorship contacts and information. 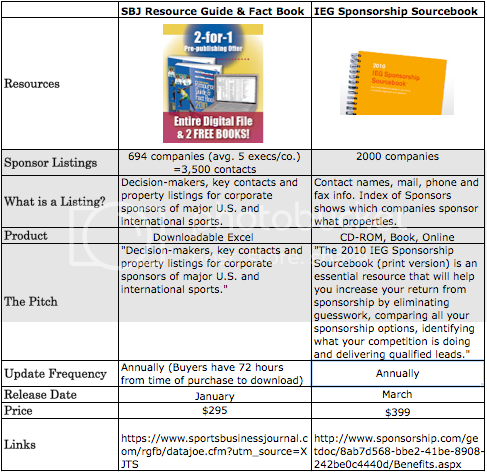 With that in mind, we whipped up a quick comparative analysis of the two most often mentioned products - SBJ Resource Guide & Factbook and the IEG Sourcebook. For the sake of this, we only looked at what kind of sponsor information each brought to the table (so for instance, for this graph we only considered SBJ's standalone 'corporate sponsors' product). Vote below on which you find the most useful and feel free to list any specific feedback or additional resources you plan to purchase in comments.